It's a absurd notion. Thousands of tourists jam into Venice on a daily basis. Save a few weeks between the Befana and Carnivale, there is no off-season anymore for a city that called itself The Most Serene. Being alone in Venice truly is an absurd notion. Or maybe it's simply a state of mind. I have, indeed felt alone in Venice. And I have seen others that seem very much alone in their private, very Venetian worlds. Sometimes we find it during brisk, winter walks at dawn. 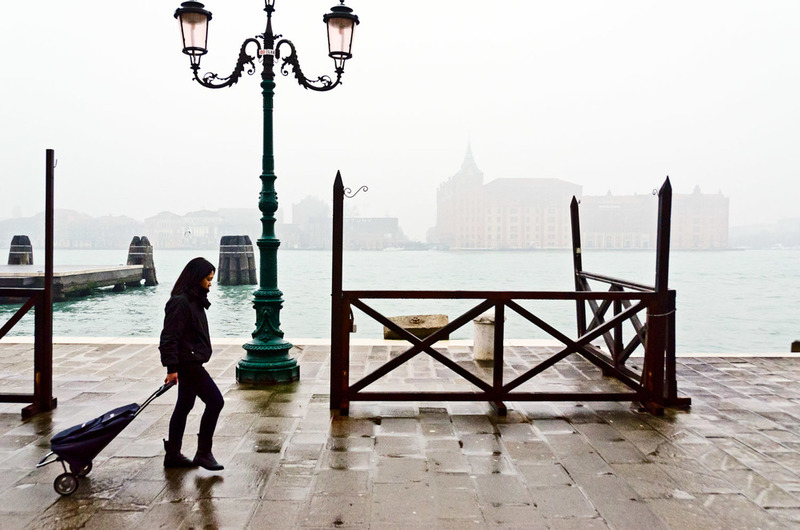 High tides, rain storms and fog are all vehicles for Venetian aloneness. I have even seen Venetians very much alone in their own universe amidst a bustling Piazza San Marco but that takes some practice. I'm not quite there yet with my inner work. External stimuli and large crowds can still push my panic buttons. Alone in Venice. It is a sublime feeling and the only way to truly know this grand city. This city, any city really, must be experienced without the company of others. It must be discovered during private walks even if those walks are among the throngs of locals and/or tourists. To walk, to sit, to watch—these are the true Venetian arts. Let others scurry to add landmarks to their checklists. The real Venice is found alone, deep in the private observations and the sublime details of this place. Rain bounces off my umbrella as I cross the Accademia Bridge. Keeping my new camera dry while photographing with it becomes its own art form. I fail at the first few attempts to keep it dry but the camera cooperates and keeps functioning. Other umbrellas pass me. I am in no hurry. I am very cold and a little wet but very much at peace. I look up at the raindrops as they find their way to the Venetian paving stones and tile roofs, as they add sheen to the monuments and statues that I pass, as they create shimmering reflections of the city in both small •piazze• and large. Alone in Venice. The locals scurry past on their way to work. Tourists willing to brave the inclement weather tighten their scarves and giggle as they pass. Somehow everyone seems present. Everyone seems alive. Everyone seems grateful for the rain and grateful for this Venetian day. We are all here together, in this moment, and alone in Venice.